Therese Loreskar started her career in 2010 as a Swedish author. She self-published her first novel which quickly became a critically acclaimed best-seller. In 2014 she signed up to a publishing house. Her novel called “The Queen of Blogging” was released and the feedback was overwhelming! People referred to the book as a modern “Bridget Jones” and couldn’t get enough of the main character, Kajsa. The next book “The Queen of Blogging 2” was released shortly after to all the reader’s delight. Therese has since then published 4 bestselling children’s books as well. She often does tours at different schools and talks about her books. The children love her visits and Therese always enjoys talking to her little readers. My name is Therese Loreskar and I’m a Swedish author. I live on the seaside in the south west part of Sweden. I used to live in Cambridge, UK, with my family for many years. I really fell in love with Britain during my time in Cambridge. I’ve been writing my whole life, but my first book was published in 2010 and I absolutely love it – this is my true passion. It’s a bit lonely to be an author but I compensate for that when I meet up with people IRL, as I do like to talk a lot. I have published ten books in Sweden so far; both novels and children’s books. I am so excited to finally have my first book published in English! The Queen of Blogging was so fun to write and I just literally finished the last one in the trilogy. 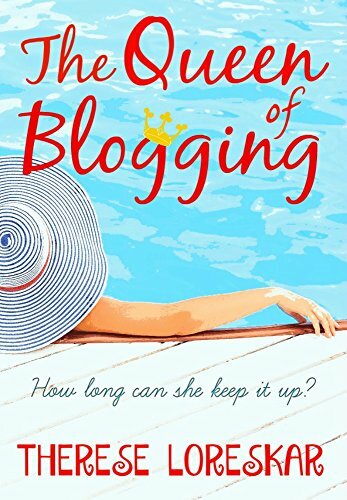 The Queen of blogging is a fast paced, entertaining story about making ends meet when you have toddlers, a husband that works too much and showing off your life on a blog for the outside world to see. Kajsa runs Sweden’s largest Health and Fitness blog. There’s only one small problem; it’s all a big lie. Between her blog entries on healthy nutritious porridge and flashy running shoes, she lies on the sofa watching TV and eating sweets. Her only exercise is using the remote control. Her life seems perfect: A beautiful house in an attractive suburb of Stockholm, three children, a loving husband and loads of money. However, things start to crumble when she accidently writes on her blog that she is best friends with a famous Hollywood personal trainer. The problem is he’s never met, let alone heard of her. An ambitious journalist, who doesn’t believe Kajsa has been honest about her blog or her friendship with the personal trainer, sets out to destroy her. Besides having to handle the annoying journalist, she must also deal with Peter, “the blog following hunk”, and a bizarre and outrageous priest who keeps spreading Kajsa’s secrets all over town! Bestselling Swedish author Therese Loreskar writes with a never-ending sense of humour and energy. This is a lovely entertaining comedy novella from Swedish author Therese Loreskar. When Kajsa rocketed to become Sweden’s number 1 Health Fitness blogger, there wasn’t anyone more surprised than her. I mean hell did everyone really think that this is how she lived? It did bring plenty cash in through sponsors though, but Kajsa was just living one big lie! The most energetic thing she did was put the work out gear on for the photos to be taken by her best friend, so she could post them onto her blog site later. It was all one big effort. There is just one hilarious situation after another, from dealing with an amorous stalker to taking part in a live broadcast. I will say she is most inventive when she needs to be. It isn’t just the blog that is the effort either as she is one very dippy lady when it comes to running the family home and looking after her little ones. This is a brilliant light hearted read and I believe there is more to come shortly. I chose to leave this review after receiving an advance copy of this book.